The New Jersey Antique Radio Club meets the second Friday of each month in Freehold, NJ, at the Grace Lutheran Church, located one block East of Route 9 on Main Street (Rt 537) -at the corner of- Park Avenue (Old Rt 33). 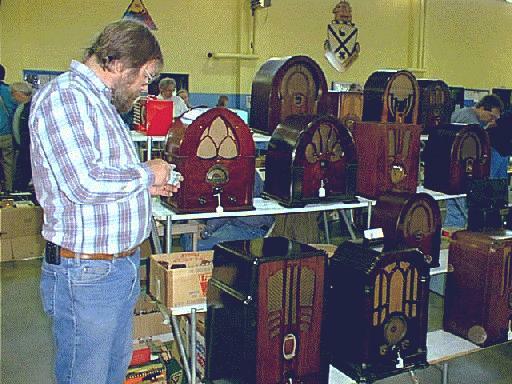 There is a small Radio Swap Meet before and after the meetings which start promptly at 7:30 p.m. Every month there is a radio collecting presentation by one of our members. Everyone is welcome to attend and join. Click here to see a Map to our meeting location in Freehold. For additional club information call: John Dilks @ 609-927-3873 - Between 6 p.m to 9 p.m. Eastern Time only! Or even better, you can send E-Mail to John Dilks by clicking here! The next meeting of the NJ Antique Radio Club will be on the second Friday of January. There will be calling hours at the funeral home in E. Bloomfield this Wednesday November 12, and a memorial service Thursday, November 13. If anyone wishes to pay their respects in person, email me and I'll send more details. Bruce Kelley, co-founder and Curator of the Antique Wireless Association' Museum, passed away Thursday, 6 Nov. 1997, at his home in Bloomfield, NY. He was 82. 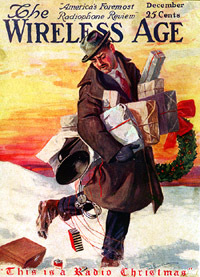 Bruce was first licensed as W8ACY in 1929. An avid DX-er from the start, by 1933 he had logged 75 countries, using a 5 watt, one tube transmitter. 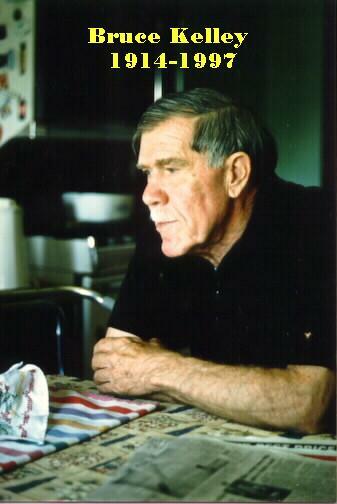 When he relocated in 1935, his call changed to W2ICE, which he retained to the present. In 1948, the late George Batterson, W2GB, asked Bruce if he would store some old ham gear in his barn, including George's 1922 spark transmitter. Since Bruce already had a fair sized tube collection, the 2 men decided to exhibit their artifacts, and opened the barn to visiting hams. This was the beginning of AWA. Others donated their "old junk", and the exhibit expanded. As AWA's curator Bruce Kelley applied his seemingly boundless energy to the task, and was active in the museum until ill health forced him to retire less than 2 months ago. His charisma inspired others to help, but he was always in the thick of it, working at what he loved best. Today, AWA has 4100 members, and the museum has one of the largest and most interesting collections of radio, telegraph and television artifacts in the country. Bruce didn't do it alone, but it would not be half what it is without his inspiration and dedication. Anyone who knew bruce would tell you he was quite a character. A good curator must be completely honest, and he was. He was also a natural leader, a great salesman, a con artist (but tongue in cheek; he warned you beforehand), and everyone's friend. Through my association with him I met dozens of the "grand old men" of radio. When I moved to Bloomfield in 1989, Bruce got on my case to learn the code. In Jan. 1990, he administered my Novice exam, by Feb. I had passed my Advanced test and was on the air. I'd have never made it without his coaxing and good natured ribbing. Farewell Bruce, we will miss you. PS- Ed Gable, K2MP, an AWA member for 20 years and a knowledgeable historian, succeeds Bruce as curator. Ed, we wish you all the best. It's a homebrew transmitter from the late 1920s to early 1930s. 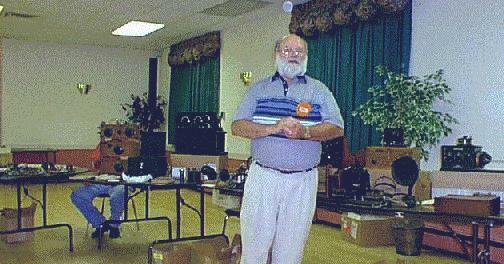 NJARC member Al Klase checks out the radios for sale at our September swap meet. was well accepted by more than fifty members of the 80 year-old club. Visit an old time ham radio station, as it would have looked in 1960. Click here. This is the best historical book to come out in a long time. Hence, I am publishing their News Release for your information. Tube: The Invention of Television is technicial and historical in nature, conversationally written and easy to understand. Almost every page is noted and the bibliography they used is truly impressive. This book is a must for every collector and historian of radio and television and anyone else interested in the industry. -ED. A new PBS documentary about the Invention of Television will be airing on the PBS show: American Experience - Watch for Reruns, it's worth it! Visit our new Old Televsion page. You'll find some interesting links. Check out the New Book on Tubes! Things you can't find in a tube manual. Just down the street from our meeting location. by John V. L. Hogan - You can read the complete article, click here. How to Remagnetize old Headphones - from our November 1996 meeting. The Swap Meet is now history. All had a good time. Check the Auction Results. Alexanderson Alternator - test transmission in connection with a ceremony declaring the Grimeton Radiostation a Historic Memorial Site on October 23, 1996. Click here for the Report Now with Auction Photo! Elgin - Our President Went There. - Click here to read about his adventure. Click here to see some of John Dilks' collection. Click here to see some of George Shields' collection. Now relocated to save HomePage loading time. Wanted: Early Radio Books and Magazines. These will be used to add early articles and information to this page. If you have any to sell or trade; please contact the Webmaster, John Dilks, K2TQN, at the mailbox below -or- by USmail at: 125 Warf Road, Egg Harbor Twp., NJ 08234-8501. You can send E-Mail to John Dilks, K2TQN, by clicking here!